Scar treatment therapy is integrating scar tissue into the underlying fascial web to improve the condition of the scar and surrounding tissues. Your scar is more than just a mark on the surface of the skin. Scar work will help reconnect and promote healing on your scar surface and reduce your adhesions in the underlying tissues. Scar formation is a natural process of wound healing. Scar tissue contains more fibrous tissue and Collagen deposit than normal skin making it structurally and functionally different. There may have been nerve damage from the injury or surgery causing numbness or sensitivity in the area. How will Scar Work affect a Scar? Scar work is done primarily to improve feeling and functionality in the scar and surrounding tissues. Creating better movement between the layers of the skin, fascia (connective tissue) and muscle. Treatments stimulate the circulation, lymphatic and nervous system to encourage renewed healing and promote tissue health. Visually, cosmetic changes can occur: Scars often appear smaller, lighter and less prominent but the emphasis is on the underlying tissue changes. The work starts with the surface layers and moves deeper into fascial tissue under the scar. Scar work can help resolve nerve impairment or symptoms such as numbness, pain or sensitivity. Changes that occur to the scar and nerve function should be permanent. Tightness in surrounding tissues is reduced, muscles function in the area can be improved. Knots and tight ropey scars are softened and loosened, ridges and holes can be minimised. Multiple treatments many be needed to gain the most benefit and response to treatment will vary for each individual. Scar Work is not like traditional scar massage. It is rarely painful, even for new scars. Using a variety of specially developed movements. I will work on your scar as a qualified practitioner working on and around the scar. Although seemingly effortless, treatments can instigate whole body shifts where patterns of dysfunction caused by old or new injures are released. All Kinds of scars from a few years old to very old, ten, twenty, thirty years and even much older, there is no time limit on scars that can be worked on or to newly healed (once you have been discharged by your doctor) can be treated using scar work. What is the Scar Work Journey? 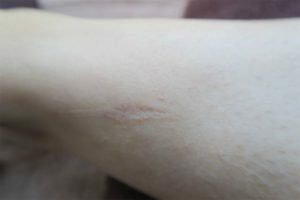 Scar Work was developed by Sharon Wheeler of Seattle, United States. At the age of 23, Sharon trained with Dr. Ida. P. Rolf, the founder of Structural Integration also known as Rolfing. Sharon works together with Jan Trewartha who is the only accredited Scar Work trainer covering the U.K. and Europe, Jan co-ordinates a professional qualification through Body in Harmony Training to ensure Scar Work standards and practices are maintained. Jan’s website includes a database of Scar Work practitioners. www.bodyinharmony.org.uk.